Salvation And Survival: Saturday Morning Commentary: Can We Just Stop The Nonsense? Saturday Morning Commentary: Can We Just Stop The Nonsense? I want to know .... Doesn't our Federal Government have anything better to do than decide which harmless and long-established American phrases have now become offensive and off-limits? Do you seriously think we need a "Chief Diversity Officer" in the U.S. State Department? Well, we have one, and his name is John Robinson. Apparently, he doesn't have enough to do over at the State Department, where he is also the Director of the Office of Civil Rights. So Mr. Robinson felt he needed to write a memo to the uneducated masses. This last week he decided it was part of his job to let us know just how hurtful and wounding our remarks can be. For example, he would like us to quit using the phrase "hold down the fort." Why? Because, according to him, it paints a wrong historical stereotype of our Native American citizens. He seems to think it implies racism and a negative image of American Indians. So when you tell your husband to "hold the fort" until you return from the grocery store, what you're really saying is, "I want you to protect our home as if it was a fort being attacked by those vicious, savage Redskins!" John Robinson wants you to think about what you're saying, and stop using this phrase. And did you know that when you and a friend decide to "go Dutch" to a movie, that this comment is also insulting? Apparently, the historical context of this expression suggests that people from the Netherlands are cheap and selfish. So, by employing this saying, you just might offend someone within earshot that is of Dutch ancestry. Of course, you knew that "rule of thumb" was disrespectful to women all over the world, right? According to Mr. Robinson, this turn of phrase comes from "an antiquated law, whereby the width of a husband's thumb was the legal size of a switch of rod allowed to beat his wife. If her bruises were not larger than the width of his thumb, the husband could not be brought to court to answer for his behaviour because he had not violated the 'rule of thumb' ". Mr. Robinson seems to think that if you use this expression, any woman within the sound of your voice will instantly know that you advocate physical abuse of women. But wait! He's not done! He also wants you to know that "handicap" is no longer acceptable, either. He says that "some in the disabled community, believe this term is rooted in a correlation between a disabled individual and a beggar, who had to beg with a cap in his or her hand because of the inability to maintain employment." Where did he come up with the historical contexts of these words? Since fact checking has become such a popular pastime among political hacks, has anyone bothered to research the veracity of his information? We needn't bother, because he invalidates his own hypotheses. After righteously declaring us inconsiderate, Robinson makes this statement: "'Now that you know the possible historical context of the above phrases, perhaps you will understand why someone could be offended by their use." Really? Let me get this straight. You, as a representative of the U.S. State Department, have declared these phrases to have historical significance, and that they might be construed as insensitive, discriminatory, and racist; therefore they should no longer be a part of our language. And you end your authoritative counsel by saying your reasoning might be correct? This is the height of insanity! 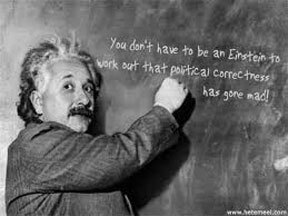 Political Correctness out of control! Yes, we should watch what we say, and be mindful of how words hurt. We all know the Golden Rule! But do we need the Nanny State telling us what words mean? Or establishing the degree of racism in our everyday expressions? What I always find interesting about these self-professed Gatekeepers of Appropriate Behavior is this .... they are usually much more guilty of personal biases than the average person; and therefore see their own intolerances in every innocent remark and behind every statement. After Mr. Robinson takes a good hard look in the mirror, perhaps he should begin policing inside the Beltway. I might find politicians a little less offensive if they were a little more conscious and respectful of how they refer to us. "Tea-baggers" and "Bible-huggers" don't connote warm, fuzzy emotions. So, thanks for the information, Mr. Diversity Expert, but I kind of like our unique expressions and distinctively American vernacular. And if I unknowingly offend someone, I would hope they will give me the opportunity to learn a little more about them and why my words seemed insensitive. But it needs to happen on a one-to-one basis. That's how we come to understand each other. Not because Big Brother mandates it. Psalm 139:23-24 "Search me, God, and know my heart; test me and know my anxious thoughts. See if there is any offensive way in me, and lead me in the way everlasting." Labels: Big Brother, Mindset, Our Culture. Good post. Tell the Emperor he has no clothes (brain?). Now, if you were to take a closer look at the "bruises on the wife" logic for Rule of Thumb, that does have some historic truth: in ISLAM! There are a-hadith (sayings of the Prophet codified into Shari'a law) that discuss using a rod or stick no thicker than a husband's thumb to punish an unpleasing wife. I've heard this issue actually debated in Saudi Arabia and on Egyptian TV -- you know, important stuff like where to hit (not in the face because it will disfigure her), not so hard (so as to leave no permanent damage), not so often (so the husband can't be accused of cruelty), what type of material the rod should be (general consensus is wood, but the Prophet wasn't specific there), not in front of servants or concubines (don't want dissent in the ranks as it were), and not so the neighbors can hear (don't want them to know you have a bad wife). Rational, sensible stuff like that, don'cha know? Press question you'll never hear on TV, "Mr. Robinson, why has the State Department taken on a position that concepts of Shari'a Law are completely unacceptable even for discussion by members of the US diplomatic corps? Is the US State Department now opposed to Islamic law and culture?" Oh my, I would LOVE to hear them choke on that one. Of course, since I disagree with him and don't plan to (ever) vote for Obama, I must be a racist...and thus I'm less than a human. I just need some more progressive, educated liberals to help correct me and make me more open minded. PS "Hold down the fort" pre-dates the whole Red Skin thing, too, all the way back to the Romans... I'll just choose to think that Mr. Robinson is being sensitive to my ancestors who were Germanic tribesmen (tribeswomen? tribespersons? -- gotta check that one) because the Romans were just so mean to them. You know, because how somebody feels is way more important than what was said, meant or done. Ooooh, you are good! Mr. Robinson better watch his back, cuz he'll have CAIR filing suit on the U.S. State Department. How is he going to explain that to all the Muslim Brotherhood plants in the government?